Who can resist issues of McCalls Needleworks and Crafts? Especially the funky Annual of Creative Handcrafts from 1971? It is chock full of instructions for macrame, batik, hairpin lace and more! Thrift stores always seem to be a treasure trove for knitting patterns. These I might actually make. As you might be able to tell I am besotted with anything with cables. Fisherman`s knits were my favourite knitting era! 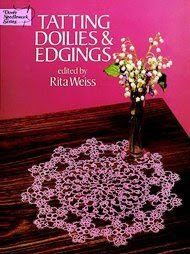 You can never have too many tatting patterns and you can never find enough tatting patterns! These old vintage booklets always have patterns for a few tatted edgings that are good for crazy quilting. And who can resist a whole jar of buttons for $2? Not me, that`s for sure! Lots of ordinary buttons in here - maybe I`ll make some button people for Christmas ornaments or??? There was also a smaller number of `keepers` - shell buttons, glass, metal, and some adorable vintage plastic ones. Well, you are thinking I paid $11 for all of this? You underestimate my bargain hunting skills! lol This is only half of the haul. I`ll show you the rest tomorrow. I know this motif has seemed to consume me for weeks and it is the only thing I have been blogging about but it is done now at last! I promise this is the last time you have to look at it! The third ornament I made (farthest to the right) has for it's center a little petit point rose that was on a stick pin. I attached it with blue beads after removing the pin part and then with the gold beads I built a snowflake around it. The outside of the ornament was done in a gold and blue bead mix and then blue beads scattered inside that. This one is my favourite, likely because I love scavenging petit point jewelry and using it in crazy quilting. With the three ornaments in place I used this week's BAS challenge stitch (Beaded Backstitch) to make strings to hang the ornaments. (Stop staring at the wonky heart! I see you looking! lol ) It was my original intent that the tops of the ornaments would be gloriously festooned with leaves and beads - very over the top. Sorry Leslie - you only get one leaf! I am putting away my inner critic who is whispering in my ear that the whole motif is too large and that doing my novice beading for Leslie, the beading queen, is like sending tea to China. I am happy and can now move on to some other stitching on this piece! I found this wonderful stitch in Helan Pearce's book entitled, Beaded Dimensional Embroidery. It is put out my Milnar Craft Series and I think it is my fvourite book this week at least! I am using it in a motif but I think it could lend itself well to a seam treatment as well. There is a tutorial for this stitch in the next post which I hope will explain how it is done adequately. If you have any questions or something is not clear please just ask. Thank you! Three kilometers down the road from the campground is the delightful little town of Milo, Alberta - at least I find it delightful! I took this picture of a fence on the main street which blocks the view of a vacant lot I think. I thought this was such a clever and inexpensive way to add a little western charm and pay homage to the ranching heritage of the area. All it would take would be a little research, a router and some fence boards! Cool, eh? I've been a little quiet here since the start of last weekend with good reason. Last weekend was the Victoria Day long weekend in Canada - the first big camping weekend of our short summer. This last winter was especially long so I think everyone felt the need to celebrate the good weather we were blessed with for a couple days. The campground was more crowded than I have ever seen it before and we were literally run off our feet. This week I have spent cleaning up the aftermath so have had little time or energy to stitch or write. This weekend is shaping up to be a quiet one though, happily for me if not for the bottom line, so I will continue with the cleanup and resting when I can. I am presently working on a beautiful wreath that Leslie has pieced. It has all the most beautiful fabrics and what a treasure it will be when it is done. I thought I would post some pics as I go along. The first thing I decided was that I wanted to do a group of beaded Christmas ornaments, inspired by the ones I saw in "Beaded Dimensional Embroidery" by Helen Pearce. Gorgeous stuff in that book! I took it out of the library and as soon as I opened it I knew I needed a copy for myself! This is the first of the ornaments, outlined in a gold and purple bead mix. I then used pearlized bugle beads and seed beads to build a partial grid pattern in the center. I used green beads to fill in between the outline and the grid. In the center of the ornament I placed a Mill Hill Treasures snowflake. All the beads used so far are Mill Hill. I was wondering why Oreo, the larger of the two dogs here with me, always gobbled up all the little one`s food right away when he came in the trailer. Typical for dogs, I suppose, but not really in his nature. Being older he doesn`t have that good an appetite. Well, it turns out it is because someone else is eating Oreo`s food. Watching this sparrow and his buddies, it is surprising how much they eat and how happy they are to have a ready and abundant food supply! lol Oreo won`t chase them off either - he just sits and watches them eat his munchies and then wonders where they went? DD gave me this little tile for my camper together with the little stand. Cute! She managed to get me to tear up as well with her Mother`s Day card on Sunday. shining down just for you? you`re here with me again. Considering it is the third year I have left home for four months in the summer to do this job, leaving her behind, she is very supportive of my choice. It is a little different this year though, because when I get back home she will have already left for her first year of university. Tugs at this old mom`s heart a bit. Here is my sample for Week 25 of the BAS (Build a Seam) challenge. You will likely recognize it was what I had started to do the tutorial on this stitch. I needed something to cover the top part of a patch and also encompass two small seams - this is the result. So, it is either a motif that thinks it is a seam or a seam that thinks it`s a motif! lol No rules, right? I did the stem in chain stitch using Glorianna Petite Silk Perle. The leaves, of course, are the feaured stitch for BAS 25, Raised Leaf Stitch. I built a spider web out of some gold thread and added a ladybug ambling along the stem and built a spider from a large crystal. I am pretty happy with how this one turned out. I have had such a good time working on Debbie's block in the Spider 2 Round Robin with CQI. I was the first to work on the block and it was a joy to stitch on. I think perhaps I have left my "inner critic" at home and found my muse here at the lake because I am so pleased with how it all worked. Obviously, this is where I was doing my Week 24 and 25 BAS challenge seams, although I removed the lavender beads I had added to the trim since they weren't working with this block's colour scheme. The little ladybug, or Ladybird beetle to be more exact, is a bead. The jewelled dragonfly and butterfly are both bits of cannibalized reclaimed jewelry. On the small gold patch I layered tatting and lace and added a filigree gold butterfly. As you can see, I finished my little stumpwork boysenberry bush - my first attempt at stumpwork! - and hung a little spider charm from some blending filament web. To the left of it is the only traditional seam I did on the block, other than the bit of trim. I did this one in a double herringbone with straight stitches and beads added, all in coordinating hand-dyed Perle cotton. I hope Debbie likes it as much as I do! For the Knitting book - Sharon! Congratulations! I hope you both enjoy your new books! Send me your addresses please and I will get these out to you! The Raised Leaf stitch has been a favourite of mine since I learned it from the excellent instructions in Three-Dimensional Embroidery Stitches, written by Pat Trott. This is a book I highly recommend as a relatively inexpensive addition to any embroidery/crazy quilting library! Here I'll show you how I make this stitch. I have done this example using Glorianna Silk Petite Perle but I would not recommend it for this. You will have better results than I did if you use four strands of good old DMC. For best results remember to strip your threads (that is, separate each strand and then put them together again). 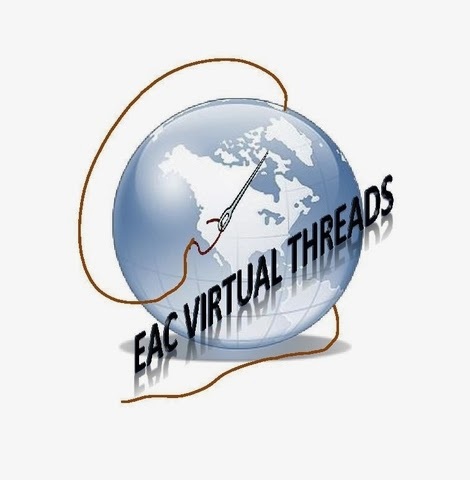 This is a good habit to be in anyway as it will make your threads lay better. So, on with the show! The stitch is worked from the tip of the leaf to the stem so bring your needle up where you want the tip of the leaf to be. The card will be held at right angles to your stitching. Each stitch comes up through the fabric, around the card, and back down through the fabric on the other side. For the first stitch it is very important to go back down in the same hole so that you will have a nice tip to the leaf. Continue on in this manner until you have five stitches looped around the card and then come up through the fabruc again as if for the next stitch. You will now take the needle and slide it under the threads on the card, bringing it out the other side so that all your loops are now on your stitching thread. Hold the stitches and gently remove the card. Now move your working thread gently in the direction of the stem and go down where you want your little stem to be. The thread holds all the loops down, forming your leaf. Here is a sample of the finished leaf. Pretty, right? Once you get the hang of it and grow a third hand to help you hold onto the card this is a great stitch and very versitile, adding a nice bit of textural interest to your leaves. To everyone who is a Mother, or had a Mother - Best Wishes for a Happy Mother's Day! One of my favourite things at the lake is the variety of birdlife. Each summer I think I should become a "real" birder, start a life list, etc. but in the winter the idea dims - how many sparrows can you get excited about? lol Sadly, that is about the only bird I see at home. Out here at the lake though there is a much larger variety and I get quite excited about it. Yesterday the yellow-headed blackbirds (yes, that is the actual name, not just a description) were cooperative enough that I was able to get a couple of pictures. I just love the splash of vivid colour on them! In my crazy quilting, I have a tendency to be to concerned with things matching and coordinating. I think bolder colour combinations might be in order like on these little fellows. My dear mother used to tell me to look to nature for colour combinations. In nature it all looks good together so if the combination appears in nature it is a good one. Good advice! The trunk and branches were Raised Stemwork and it was new to me and a great stitch. I love the effect and will definitely keep using it! While packing my stash for the move to the lake I found duplicates of a couple books. What can I say? It must be really appealing to buy it twice! So, I have two books to giveaway. 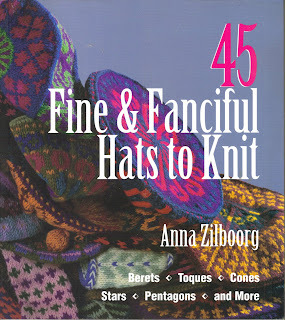 The first one is "45 Fine & Fanciful Hats to Knit". My knitting skills aren't up to this, I'm afraid - I wish they were because it is a gorgeous book! So, to enter the giveaway simply leave a comment with your email address and indicating which book you would like to go in the draw for. I'll draw names sometime on Monday. Thanks! What can I say? The dishcloth obsession has returned! My eyes were starting to get fuzzy the other night and I needed something other than stitching to occupy my time so I decided to start on some of the dishcloths from the Monthly Dishcloth KAL group at Yahoo that I have missed since I have fallen behind. This was the one for mid-April and it is called "April Showers". It seems appropriate to post it today since I am presently enjoying the first spring rainfall of the season, Lovely! Things should start to green up now! This photo is of the kitchen taps in the trailer. If you look closely you will see the faucet part is not where it should be. I turned on the tap and that part just fell into the sink! Needless to say, a surprising amount of water managed to gush out of that little black hole. I wish someone had been here to play Ethel to my Lucy as I scrambled around looking for a towel! Wahhhh! In fact, I wish my brother David had been here. I am not sure how he would feel about playing Ethel but he could have been Desi! In either case, I am sure the misadventure would have ended in a few gin and tonics if he had been here. Now I will have to make a pilgrimage to the RV store to get another set of taps. There is information on Big Horn Mountain Creations about a draw for a quilt as a fundraiser. 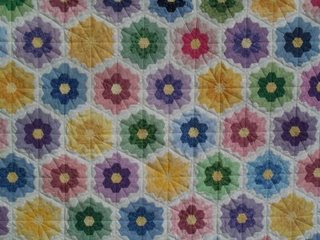 This is an absolutely beautiful hand pieced Grandmothers flower garden quilt done all in tone on tones. You can receive one chance in the draw just by visiting their blog! If you decide to get more chances on the quilt tell them Kerry sent you and I will get some more chances for referring you! For more details and information on the draw and the quilt, please visit Big Horn Creations. This is a great cause and I admire a woman who takes the skills she has and uses them to solve her problems. Check it out! 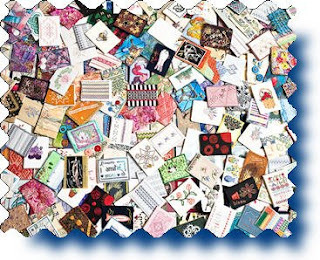 The Embroiderer's Association of Canada held another ATC swap this year and these are the results - over 280 Artist Trading Cards! There are a lot of different techniques to admire. 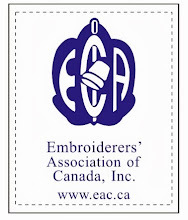 EAC has just put pictures of all of the individual cards online and you can see them by visiting their website. As you look through them you will see a number labelled "Remembrance of Mary". These special cards were prepared in tribute of Mary, a long standing member who has passed away within this last year. These special cards were constructed using some of Mary's own embroidery. I have no doubt that the large number of ATCs sent in for this year's event were in hopes of obtaining one of these cards in return. That in itself is a lovely tribute to Mary. This is how my week 24 sample for the BAS challenge turned out. I started by making Roses with Padded Satin Stitch Centres (using instructions from A - Z of Bullions) on every other scallop of the lace. They were stitched using Sampler Thread from The Gentle Art that I picked up recently because I just loved the colour. I used hand dyed silk ribbon to add a leaf on either side of each rose. In the picots along the edge of the lace I added pearl beads. Lastly I used pale lavender glass beads to line each side of the ribbon portion of the trim. I am pleased with how it turned out - it is always nice to try a new stitch, which this rose variation was for me. As always, you can click on the picture to view a larger version. The colour is a bit off but you can get the idea. Ahhh... this morning I was up early enough to receive a glimpse of sunrise behind the lake. It was beautiful and clear but as the morning progresses it is beginning to look more and more like rain. I guess the old saying is true: Red sky at morning - take warning. The sunrises are another of my favourite things about being out here. I don't have a clear of view of them at home so this makes each one special. Well, I think it is time to introduce you to the rest of the staff at the campground. This is my darling Pomeranian of 13 years. Her job here is to guard the inside of the trailer and to use her body weight to hold keep the pillows from flying away. She is very diligent and takes her job seriously - sometimes she will spend all afternoon on the bed holding down the cushions! I have had a Pom in my family for 40 years now without a break and obviously from that you know I love these little guys. Nala here is like all Poms who are said to suffer from Small Dog Syndrome. I prefer to think she has the heart of a lion beating in her furry little chest! Sometimes this gets her in trouble. As you can see she has lost an eye to a Rotweiler she thought she could put in his place. This is the last member of the crew. His name is Oreo and he takes a lovely picture when he smiles but in this instance he was clowning around. Serves him right having this picture posted online for not saying cheese when he is told! Oreo is a border collie and they have beautiful smiles. He is my doorbell letting me know when someone arrives. He is also responsible for making sure guests don't steal any blankets and he achieves this by joining them in bed and hogging the covers all night. DH is trying to convince me that Oreo deserves to retire and stay at home in the summer - what do you think? He is getting almost as much grey hair as me. Does that mean I deserve to retire too? I am happy to be taking part in Pat Winter's Puzzle Piece Swap. Everyone taking part is making four puzzle pieces to a set size and shape in whatever form of mixed media artwork you like. What we receive back is four puzzle pieces made in different artforms from four different people all made in friendship. We will each get to put our little puzzles together for a wall hanging. Of course all of my pieces just had to be crazy quilted. 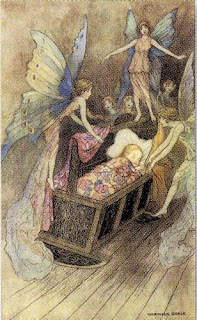 The first one, above, is an under the sea theme. I love detached buttonhole stitch so I used that to make some fish netting at the bottom. I added some starfish using whipped spider web stitch as well as a small seashell charm. The plant growth was made with feather stitch and couched ribbon. The fuzzy beige one was especially fun to do. It was a fuzzy ribbon and with a simple gathering stitch it became a very textural bit of seaweed. This is the second piece I made and it is a more traditional bit of crazy quilting. There are two butterfly charms as well as a dangling fan charm. In the botom left corner patch there is a single oya flower. I attached a mother of pearl button with a tiny bead swag and some lace adorned with beads. All the tiny seams were fun to do. The third puzzle piece is another under the sea one. There I used more feather stitch, some wispy yarn couched down and a tiny seahorse charm hiding in it. There is a fish charm swimming along and more woven spider web starfish. The last thing in the bottom corner is a piece of tatting that I think I have decided is some kind of coral. The last puzzle piece is another more Victorian one. I started by adding a tiny silkie I had. There is a tiny blue crochet butterfly, some dyed lace flowers and a couple more of the tiny butterfly charms. Along with the stitched seamwork I used a tiny piece of gold braid trim on one seam. This has been a lot of fun to do and I can't wait to see what I receive in return. If you would like to see more of the puzzle pieces being made for this swap, you can visit the Pieces of Friendship blog. 1. A surprising number of people seem unable to read the fishing regulations, proven by the number of tickets Fish & Wildlife have been handing out here every day. Um, fishing season opens next week...duh! 2. Cow poop is heavy! A bane on farmers who can't seem to keep their cattle home where they belong but rather let them run hither and yon (and into the campground). I have picked their little cow patties up from less than half the campsites and already I have six huge bags of poop. Maybe I should have a giveaway for it here on my blog! Any gardeners in the crowd? One stipulation though - you have to pick it up or pay the postage. I have mentioned before I am in a Secret Sister swap on the Yahoo group, Quilting on a Budget. This swap appealed to me because the budget minded organizers set the rules to say that everything you send for the entire year must cost you under $10! I like a challenge so this appealed to me and my thrifty ways. Above is the package I received from my Secret Sis recently. I think that the thing I like most about these little gifts is that they always seem to be little handmade treasures and neat little things you don't get for yourself. As the "To Do List Queen", I love the pretty notepad. And the cute little fabric chickie frig magnet is perfect for attaching said lists to the frig where I can see them. Even the little sachet is perfect. It smells just like laundry that has come in from the clothesline! It is giving my whole trailer a lovely fresh scent which is a bonus since I spent the whole day picking up cow poop (but that is another story! lol) So, my sincere thanks go out to my Secret Sister, whoever you are!! Thank you all to your patience while I took a brief hiatus to get myself moved and settled for the summer. Hopefully this won't seem like a cheat but this week's challenge is not a stitch but rather a question: What would you do to personalize purchased trim? There are some beautiful trims out there like the one above. I fell in love with this one the moment I saw it with the lucious velvet ribbon attached to the crochet edging. Recently though I have started to develop a slight disappointment in seams which are made from a purchased trim. I so much prefer to see them used where there has been something added to it to personalize it - stitching, beads, etc. Just tacking down a bit of trim is, well, disappointing. So, I hope you will not be disappointed that this week is not an actual stitch and will continue to play along with me in this challenge!